There’s no easy way to part with those we love. Wherever there is attachment and loss, there is the pull of grief. Learn how to cope when you are bereaved. There’s no easy way to part with those we love. Wherever there is attachment and loss, there is the pull of grief. 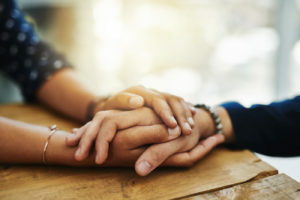 “While death ends a life, it does not end the relationship,” says Amy Greene, MDiv, DMin., Director of the Center for Spiritual Care at Cleveland Clinic. “Adjusting to the new reality takes time and does not follow a totally predictable pattern (in spite of what many people will tell you),” she says. 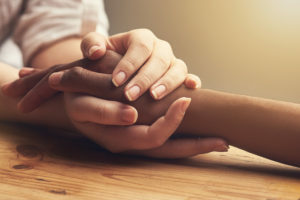 Grieving is a process as unique as every individual who experiences it. At times, emotions may get tucked under a rather out-of-body feeling. At other times, you may feel your insides squeeze with loss. One day, you may feel like throwing something that would shatter. Another day, you could feel a strange sense of peace. This is why, Ms. Greene says, it’s so important to be patient with yourself. You have your own unique way of handling things. Often, the caring and well-intentioned people around you lack understanding about grief, and about the natural process of grieving. They might say, “Keep busy.” But often, this simply postpones a necessary emotional upheaval, a process we all have to go through. Do your best to be patient with those around you whose intentions may be kind but who sometimes speak without enough forethought about what a bereaved person is really feeling. “Unless a person is trained in grief counseling, they may find it challenging to understand the phases of grieving,” Ms. Greene says. It is a myth that “time heals everything” or that you must “move on” within a certain number of months (or even years). Grief can last a long time. This why it is important to find professionals and/or support groups (preferably both, according to Ms. Greene) that can help you continue to monitor what is “normal” grief. “This can help you take precautions as well as get the help you need and deserve if your grief becomes more complicated,” Ms. Greene says. People may mistake the very normal phases of grieving for something unhealthy. “After a deep loss, it’s normal to struggle to eat or sleep. Often, people don’t drink enough water. They may not want the sleeping pills. They just go through this intense sadness, which is normal in the first few months,” Ms. Greene says. At this stage, people around you may become overly concerned. But after decades of marriage or after losing a child or someone dear to you, learning to live without them in your life can’t happen quickly. It is a process. This is different from depression, which does happen, too. This can occur if a grieving person gets into an unhealthy spiral of lack of sleep or unhealthy eating and drinking habits, or lack of exercise — especially if these habits continue more than a few weeks. People are especially at risk for depression if they don’t take good physical care of themselves as well as if they become too isolated. To combat this, Ms. Greene suggests joining a support group moderated by a trained grief counselor. “It helps many people realize, ‘I’m not alone.’ They see that grief is a human thing we all share,” Ms. Greene says. Accept some loneliness. Loneliness is completely normal, but it is important not to get too isolated. Reach out to people and support groups who are comfortable with grief — who can let you move through the process at your own pace. Choose good company. Look for friends, old and new, who know how grief feels and who can let you be “alone but not alone” when you just need company and who won’t place any further burdens or expectations on you. Be gentle with yourself. Try not to judge yourself for not “doing better” or “keeping it together.” It will get easier over time to feel like your normal self. Get extra rest. Physical and emotional exhaustion is common. You will need more rest than usual. Embrace all emotions. Realize that feelings come whether we like it or not. All we can do is let them move through, like waves in the ocean or clouds in the sky. It is neither weak nor abnormal to feel these waves. There are many approaches under the category of “mindfulness” that can help with emotional self-regulation. It’s also important to know when to seek professional help. Set a regular sleep schedule. Make it a goal to go to bed and awaken at the same time each day. Give yourself a good amount of time to rest, but be on guard for sleeping too much as a way to avoid the hard work of grieving. Move your body. Get up and walk or move around, preferably outside, at least a little each day. Talk to your doctor. Tell your primary care doctor you are bereaved so he or she can help you keep an on eye on healthy habits. Keep structure in your day. This means groom and dress, even if you are not leaving the house. Also, eat small, regular meals, even if you are not hungry. Set goals. Set small, reachable, short-term goals so that you don’t get overwhelmed. Make a list of daily activities. This can help while you are grieving because forgetfulness is common. Be cautious. Do not make any major decisions or changes in home or work right after you are bereaved. Take care of your inner needs. Find time, whether through a spiritual practice or a creative outlet, to connect to things that give you inspiration and help you maintain your sense of meaning and purpose. You could keep a journal, write a song, poem or letter to your loved one.